If you have the time and the bandwidth, this short (12 minute) recording is worth listening to. It captures a certain quality that is difficult to convey with written language alone. Please note that the text has been edited and differs slightly from the original recording. 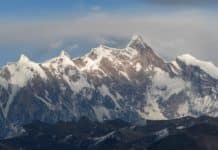 Searching for Shambhala, an article written by James George in 1976. Chronology: a partial timeline of James George’s accomplishments and continuing activities. 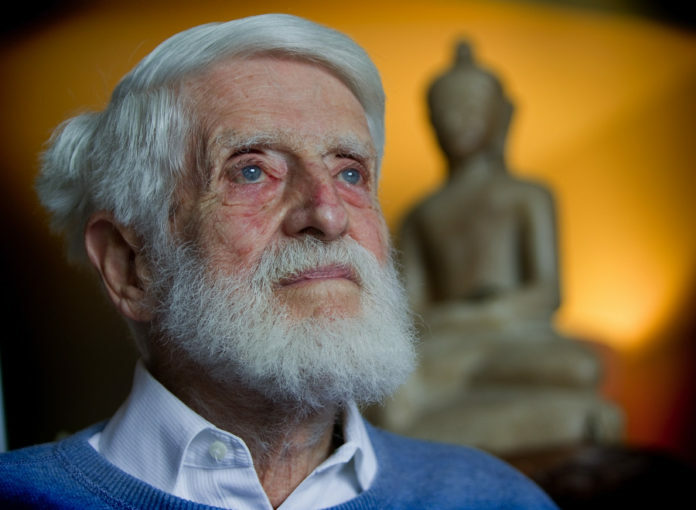 Although perhaps best known as a distinguished Canadian diplomat and an effective environmental and political activist, James George is first and foremost a spiritual seeker. 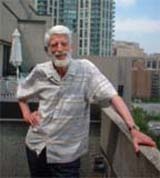 He has been a devoted student of the Gurdjieff Work for more than fifty years and was a close disciple of the late Madame de Salzmann, one of Gurdjieff’s primary students. With her encouragement, he and his wife, Carol, explored the spiritual traditions that formed the foundation for Gurdjieff’s early training. While stationed in India, Sri Lanka, and the Middle East, the Georges met with a number of remarkable men, including Krishnamurti, Thomas Merton, Yogaswami of Sri Lanka, Dr. Javad Nurbakhsh (Sufi master from Teheran), Dudjom Rinpoche, and Dilgo Khyentse Rinpoche. This underlying interest in spirituality is the thread that runs through all of James George’s activities and accomplishments. JG: Well Walter, I don’t know that I can do justice to this occasion but I’m very honoured to try, and even as we speak now, remembering Trungpa with much respect and much affection and asking his forgiveness for all the things I’ve forgotten that he told me and that you’d like to know. But some things have certainly remained very vivid and I suppose partly because I got to writing about Shambhala. His interest in Shambhala certainly sparked my interest in it. But let me go back a bit and begin at the beginning. My wife, Carol, and I went to India in September 1967 and I think it was the next summer she was in London to drive a Land Rover back to India with our kids. I joined them part of the way on the return trip to India. In that visit to London, I think she met Trungpa for the first time – that would probably be August of 1968, or July. So it was natural that, having invited him to look us up in Delhi when he got back to India, he did, and in fact lived with us for most of that autumn, I think, from October through December 1968. The culmination of that visit was a beautiful pilgrimage we made as a family with Trungpa and I think Tendzin Parsons was also on that pilgrimage. Using our Land Rover, we went camping through all the Buddhist holy places in northern India, southern Nepal, Lumbini, Benares, Bodhgaya, and so on. It was a great time to be with him, and he of course made it very vivid, since I think it was in some cases, the first time he was able to visit these places. 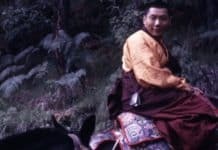 It was, I think, during that visit in the fall of 1968 that Trungpa began to speak a little about Shambhala and Gesar of Ling and I, as I’ve written, asked him to describe what he was able to tell me about Shambhala. He pulled out his mirror – a metal disk mirror that he wore on a cord around his neck – and started to look into it with deep concentration and describe Shambhala, just as if he was looking out the window. It was very vivid and it got me researching Shambhala in a more serious way with a view to perhaps publishing something. Eventually I produced an article called Searching for Shambhala, which was published in Search: Journey on the Inner Path, edited by Jean Sulzberger. I had sent it to Trungpa in 1976 to see if I was allowed to publish this material and he gave his permission. In this article, I was exploring whether Shambhala was an allegory or a real place or both. And since that’s already published and on record, I don’t need to speak more about that perhaps. Trungpa, at that time, was not certain what he should be doing on this mission. 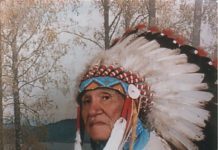 I think it was a few months later in the early part of 1969 that he decided to team up with Akong Rinpoche at Samye Ling in Scotland [ed. note: Samye Ling was founded in 1967.] and when he came to say goodbye to us before setting forth for Scotland and Samye Ling, I said to him, “You know, perhaps it’s out of place to say this to you, but I see Samye Ling and Scotland as much too small for what you’re going to be bringing to the West. You’re going to have to wind up in America somewhere, because that’s the big country.” Even at that time, the lamas were telling us that the dharma is now in the West and when we would ask them what they meant, they would say “America.” So I said to Trungpa, “Maybe your role is to bring the dharma to America and this would be a tremendous awakening, devoutly to be wished.” And in due course, I guess that’s what happened, although I never imagined at that time the scale of the awakening that he would create in such an extraordinarily short time. The people he attracted, the intensity of the search, the shift in consciousness in so many of his pupils, I think, helped to shift the entire North American cultural scene in a significant way and that shift is continuing. This is one of the green sprouts coming up through the wasteland that our culture of the thirties and forties and fifties had pretty well created to the detriment of the entire planet, which is suffering ecological distress and crisis. He saw very clearly that the energy that animates us in our sitting practice and on our cushions has to be brought out into life. He saw that this energy is the yeast that can facilitate a change that is absolutely necessary at the cellular level in individual people, and from there into the whole culture. He saw that bringing meditation into our daily lives would make it possible, in due course, to avoid a culture of destruction and war, and violence and fear, and generate a culture of consciousness, nonviolence, and fearlessness. In that sense, I think he always intended the Shambhala Training as a kind of outreach into the world and at the same time an inner preparation for the dzogchen teachings, the mahamudra teachings about being present in the moment no matter what — just aware — not thinking, feeling perhaps, but not reacting and maintaining this awareness in the face of whatever happens out there in life, ordinary life. So there were no boundaries for him between the secular and the profane. There were no distinctions, finally, between samsara and nirvana. When I visited Trungpa in Boulder at his home in 1983, he was seeing, as I was, that we were in a rather threatened strategic situation. At that time, the United States was positioning its Pershing nuclear missiles on the border of East Germany. If fired, these missiles would reach Moscow in about 12 minutes and the danger of mistaken retaliation by misinterpreting radar signals seemed to be very great. I had been writing and campaigning about this dangerous situation in the peace movement, and I shared my views with Trungpa at that time. I think this supported his decision to move the centre of his operations to Halifax, out of the United States, and out of Colorado – where the strategic command was located at Colorado Springs – and find a safer haven for his people and for his work. Of course he accomplished that move to Halifax only a year before he died. But the decision has stuck. You haven’t moved back in any substantial degree, and I think Halifax and Nova Scotia have benefited from having this influx of practitioners who are committed to doing something more than sit in solitary or collective meditation. You have taken the practice into your lives and into the creation of a more enlightened society in so many practical ways. There’s something else I could share from an historical perspective. When I visited Trungpa in Colorado in 1983, he already had the court thing going and the formality around his person. I noticed that many of the protocols that he introduced, had been lifted directly from his experience in Delhi living with us and observing how an ambassador functions and the formalities that surround him in a country like India, which loves formality. I think much of Trungpa’s court formality was inspired by his experience of diplomatic life with us. When I was on that visit, he asked me to stay. And I said, really I’m supposed to be back in Crestone tonight. So I took my leave and got into my car and my car wouldn’t start. It had been working perfectly when I arrived, but now it would not start. He kept me there for several hours that way before he released the car to start, which it did in due course. But it was interesting that he produced that. So that’s another anecdote for you. But these anecdotes only point to the real thing, which is the preparation of humanity for a level of consciousness that lives with awareness in the moment, and not just in the moment. We can learn to sustain that awareness by bringing it into our life, our conversation, our writing, our being, because it doesn’t come from us personally. It comes from a much higher source that is waiting to get into humanity, if only we would wake up and get with it. So, for each one of us, this search for Shambhala is a practice of coming to this moment in a different modality of awareness. I think Trungpa Rinpoche’s influence through so many lives, not only in North America, but in Europe and other countries, has been immense and little appreciated, because it has moved quietly and modestly and, for the most part, below the radar of the media. I’m reminded of what Bernie Glassman has been doing in New York. The Greyston Foundation, which he started, provides housing for people, and operates a bakery that is a huge business now. Greyston has created a way for Zen to enter into relations with others who are practicing, whether they carry a Buddhist name or a Christian name or a Jewish name or a Gurdjieffian name. It doesn’t matter because we’re all seeing that, in origin, the human experience has gradually come to understand what could generate bodhicitta and nonviolent awareness. All of our activities – whether we’re trying to improve the conditions of the poor, or teach meditation to prisoners in the penitentiaries, or give bread to those who need it, homes to those that don’t have them – are just the outer support for an inner practice of freedom from conditions. Without that practice, no awareness can develop. Without that practice we lose the connection to a greater consciousness, with which we have been blessed. I think we all share the hope that human consciousness can evolve. We’re probably not going to evolve much more physically, that’s been done. But we don’t want to be stuck with the consciousness that was appropriate for hunting and gathering and the violence that was even necessary to prevent ourselves being devoured by predators. We’ve now become the predators on the planet and are destroying our resources and each other, one-hundred-million dead from war in the last century alone. It’s really shocking as a measure of human consciousness as it presently is. So that transformation must take place or we’re down the tube and so is the planet. Therefore an evolution of consciousness is what I think fundamentally – aside from whatever lineage we represent – we’re all trying to work for and search for, in ourselves, and collectively in our little groups. When Trungpa came to America, he was not presenting the Buddhism of Tibet, exactly. When the dharma crossed the mountains with Padmasambhava, it had to change, and did. And with Trungpa, it had to cross the seas and change, and that change is still in progress. Of course anybody who is trying to change a tradition is up against enormous fundamentalist resistance, both from those who understand and want to protect something in the original that could be distorted, and from those who are just attached to a form and want to preserve it without really understanding the living spirit that gives it life. So he had to withstand pressures from all these different angles, and at the same time make something that someone like Allen Ginsberg could appreciate. I worked with Allen in New York for several years and he owed an immense debt to Trungpa. Allen would never have been able to connect with the dharma if he had just been taught in the Tibetan style. So transplanting buddhadharma into a western context was a very tricky thing to attempt and to carry out and Trungpa Rinpoche did it in a very short time. 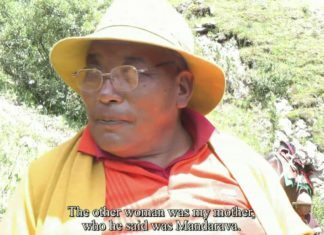 We were friends of a remarkable English lady, Freda Bedi, later known as Sister Palmo, who should be recorded as a patron of Trungpa. She started the young lamas program with her own money; I was one of the trustees of her foundation for awhile. She sent Akong, Trungpa, Sogyal, so many of the promising tulkus, to Oxford or Cambridge and gave them a university education, so that — knowing both languages in a sophisticated way — they could teach fluently in English and translate Tibetan texts into English. She understood that such translations would be so much better than the work done by Evans-Wentz, which were hopeless translations compared to what Larry Mermelstein and your group of translators in Halifax have been doing, as well as Chagdud’s people, and others. It has been a remarkable job, comparable to the translation from Sanskrit into Tibetan, with long lasting effects and benefit, I’m sure. JG: I don’t know how his life will be assessed in the end. It’s too soon. He’s already recognized as a pioneer in bringing a fresh Buddhism from Tibet to North America and Europe. But he also needs to be seen as a spiritual pioneer in his own right. Look at the influence of someone like Longchenpa. He did it through his books and through his pupils, just as Trungpa did, and that influence is still touching lives today. There’s a wonderful translation of the Precious Treasury of the Basic Space of Phenomena by Longchenpa that just came out from the Padma Publishing line of Chagdud Rinpoche, which I thought was splendid, sort of the heart of dzogchen. I feel Trungpa was getting us ready to appreciate such teachings and be able to live them a bit, and to prepare others for the same transmissions. I’d like to read a poem that I think is appropriate, if you’ll give me that book that’s on the shelf beside you. This is RenÃ© Daumal’s poem translated from the French, written at the end of his short life when he had already become, I think, one of the outstanding pupils of Gurdjieff. RenÃ© Daumal is quite well known in France as an avant-garde poet of the twenties and thirties. He died in 1944 at the age of 36. This poem was his last summing up. I think I have it because I do not try to give. And in desiring to become, I begin to live, I begin to live. WF: That’s marvelous. Thank you. When Carol and I were back on leave from India in 1971, we visited Trungpa at Karme Chöling in Vermont. The three of us walked up to the great meadow together and he was enjoying the spaciousness of it – saying what a wonderful energy it had, which we felt too. The next time we were there was in 1987 for his cremation, watching all those rainbows out of a clear sky, hearing all the lamas chanting, feeling so many thousands of people practicing together. You know, such an event is not a small thing. It leaves a mark on the culture and it ripples out in ways we cannot understand. WF: In your book, Asking for the Earth, I learned that Madame de Salzmann met Trungpa Rinpoche in India. Mme de Salzmann, India, 1971. JG: Yes. I had two wonderful, visits from Madame de Salzmann in India, but she met Trungpa in Paris. She met other lamas: Dudjom Rinpoche, Kangur Rinpoche, and I think Kalu Rinpoche and Chatral Rinpoche, while she was in India. They called her the Queen of the Dakinis, with great respect. 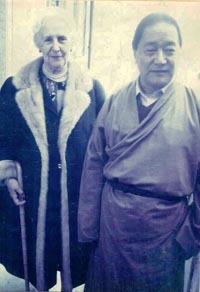 They got on very well, and I have a picture I’ll show you of Madame de Salzmann with Dudjom Rinpoche. I can’t tell you much about Trungpa’s meeting with Madame de Salzmann in Paris because I wasn’t there at the time, but I had arranged it. Namkha’i Norbu Rinpoche met her in Paris as well. JG: I don’t think so. If she did, I don’t know about it, and I think they might have told me. She was very interested in her contact with the Tibetans. She began to introduce sitting meditation practice in the late fifties and early sixties following her contacts with Zen masters. Madame de Salzmann visited Japan and met several of the leading Zen masters of the day before she met their equivalent, the Rinpoches, in the Tibetan tradition. She was very interested in both streams of teachings, and I believe her interest has influenced how we, in the Gurdjieff Work, approach sittings. When DT Suzuki came to our New York groups and saw our movements, our sacred dances, he said: “I wish we had this in Zen. We have a meditation walk, but it’s not the same thing. It’s not so demanding.” He was very attracted to what Gurdjieff had done with the movements. I think that they are probably Gurdjieff’s unique contribution: the attention created by a whole class moving as one. When the dancers can give up their own personality movements, and really listen to the music and really feel the connection with the other movers, and what animates all of them, they move together like a flock of birds turning absolutely together. You can analyze a movie of a flock of birds frame-by-frame, as they swirl in one direction or another, but you cannot find a leader. They just do it together. When one is in a state to dance together in that way, it’s quite a different consciousness. Having had a taste of it while dancing, then there’s the possibility that we might be able to reach that state again on a cushion, or in conversation, or whatever we’re doing. Trungpa was very interested in what Gurdjieff had tried to do because, in a way, he was trying to do the same thing. They both were confronted with the task of taking an understanding that was born out of eastern spirituality and (in Gurdjieff’s case) the roots of eastern Christianity, and translating that into language that was accessible to contemporary culture. Gurdjieff spent three and a half years in Tibet. He wrote in Meetings With Remarkable Men, his autobiographical work, that he was taken to a central Asian monastery in Kashmir or Tibet called a monastery of the Sarmoung brotherhood. Now, Surmang, the seat of Trungpa’s lineage, is just a transposition of vowels, which I think, may conceal where Gurdjieff received much of his teaching. His essential teaching, his oral teaching (as distinct from what he wrote in his books) was all about what you would call dzogchen and I would call awareness or presence in this moment. JG: Yes, I do. I don’t think he would have used that code word for his most sacred place of teaching, if he hadn’t been there. I do think that’s where he was. But there is no record of that and he was very careful to cover up any traces of where he had been so that people wouldn’t just go dashing off to find something that wasn’t there anymore. WF: In Trungpa Rinpoche’s will, he said something to the effect that he didn’t want anyone to systematize his teachings the way that Ouspensky had systematized Gurdjieff’s teachings. He felt that Ouspensky had systematized Gurdjieff overzealously. JG: Perhaps he did. We owe Ouspensky a lot for the clarity of his report, but we’ve been trying to get out from under that sort of systematizing ever since, and I think we are getting out of it. The fact that we can talk about dzogchen commonalities and so on, is proof of that. Ouspensky recognized at the end of his life that he probably made a mistake in breaking with Gurdjieff over twenty years earlier. So all that time, Ouspensky was in England writing about what he called The System. After Ouspensky died in 1947, Madame Ouspensky called Gurdjieff back to New York to deal with all the Ouspensky people whom he had told to have nothing to do with Gurdjieff. And Gurdjieff told them, not in these words but in effect, “Start all over again. You’ve got it all in your heads and you’re not practicing in a right way. Don’t let the spirit harden into some form; because, although it creates all forms, it is not the form. Only from the living juice of the spirit is anything alive coming through.” This is just the sort of approach Trungpa might have made: shake things up. When forms become lifeless, they turn into idolatry. Idolatry is worshiping that which is less than the Unknown. To be entirely open, to surrender to the Unknowingness of the Unknown, is an extraordinary challenge, and it needs fearless warriors to respond. JG: Really not, no. No significant letters, in any case. And yet whenever we could meet, we’d phone him, and meet him, and it was as if we’d never left each other. WF: Well I know he always spoke so fondly of you. This has been a wonderful account. Thank you so very much for your insight and for your continued friendship and support for our community and for Trungpa Rinpoche’s teachings.